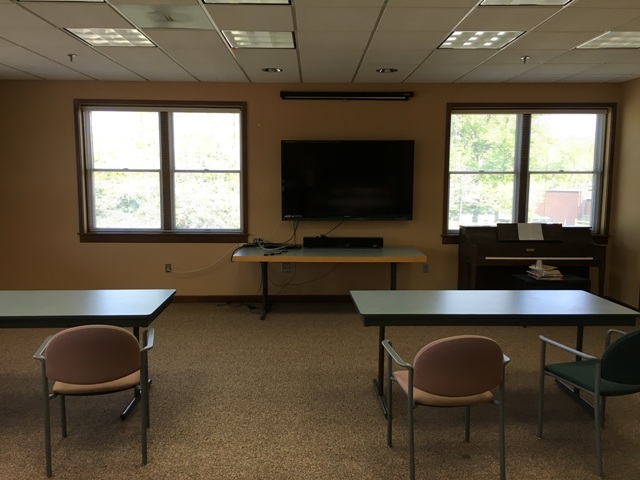 The Bayport Public Library is pleased to make the White Pine Community Meeting Rooms available on a widespread and equitable basis for promoting the social and cultural well being of the community. Meeting rooms can be used for educational programs, group meetings, company training sessions, and for occasions like birthday parties and baby showers. Hours – Meeting rooms are available for use (by advanced reservation) from 7 a.m. to 10 p.m. 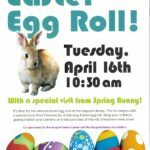 Please call the Library at 651-275-4416 to make your reservation. Meeting Rooms are not available on major holidays including New Year’s Day, Memorial Day, Independence Day, Labor Day, Thanksgiving Day, Christmas Eve, Christmas Day, or New Year’s Eve. Reservations are requested at least one week in advance when possible but not more than one year. Scheduling is on a first-come, first-served basis through the library. At the time of the reservation, please include equipment needs and room preference. Long-term reservations, on a daily basis, will be considered on a four-consecutive-week basis. Rental Fees, Effective 4/1/2018 – Billing will include set-up and take-down times. – Meetings, which are not for profit. – Meetings held during library hours.- Meetings that meet the above criteria but are scheduled before and/or after opening hours will incur charges ($25.00 per hr) for those hours the library is not open. – There is no charge for use of AV and sound equipment. Please discuss specific requests with staff when reserving the room. The renting party will be billed for the hours between the reserved starting time and the time of check out and departure. The meeting room charges/policies may be waived at the discretion of the library director or Library Board. There shall be no restrictions regarding religious, political, or business activities other than the group be lawful and not disturb other library functions in any way. The library reserves the right to deny or terminate the use of meeting rooms as a result of disorderly conduct or violation of rules. Groups or individuals that believe they have been unjustly denied use or wrongfully limited in their use of the meeting rooms and those who wish to petition for a waiver of rules stated in this policy, may present their arguments to the Library Board. To do so, contact the library director at least one month in advance of the date permission is desired. The library staff will be available for opening and closing the library building. Keys to the library building will not be available to meeting room clients. The responsible party will sign the logbook prior to obtaining access to the meeting room facilities again upon leaving, to verify departure time. Room arrangements and cleanup are the sole responsibility of the renting party. All facilities used must be left in a neat and orderly condition. Alcoholic beverages, illicit drugs, and smoking are forbidden in the library building. Music and dancing are allowed, but may not interfere with library services. Amplification must be minimal due to the residential neighborhood. Food may NOT be cooked in the building. – Prepared food may be served by a caterer or group member. – A refrigerator and freezer are available for use by groups. – The library does not provide paper products (napkins, storage bags, plastic wrap, etc.). 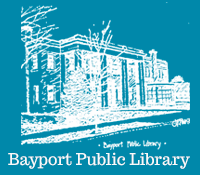 The Bayport Public Library and the Library Board will hold meeting room clients responsible for damage to meeting rooms, equipment, and furnishings. The Bayport Public Library may not be used as the address or headquarters for any group. “The client agrees to indemnify and hold harmless the Bayport Public Library, the City of Bayport, Library Board, and the library staff for any and all claims, damages, actions, suits, or loss whatsoever, brought or asserted by the clients or by any of its successors, assigns, licensees, invitees, pertaining to accidents, injuries, or loss of any kind occurring or alleged to have occurred on or about the premises during the course of the use of the premises by the clients. There is meeting room parking in front of the library building. It is a one-way street with parking allowed on both sides of the street. There is one parking spot that has a “One Hour Parking” sign beside it, which is the only spot for one hour parking. Parking is also available on 5th Street. The small parking lot in the back of the library is reserved for library patrons, please do not park there. Thank you in advance for adhering to these guidelines.